CEO Joe Tucci touts EMC's ability to hit the key movements--cloud computing, virtualization, and big data--that are revamping enterprise IT. Storage giant EMC reported strong fourth-quarter results with a 2012 outlook that was in line with Wall Street expectations. The company also expects to grow twice as fast as information technology spending overall. EMC reported fourth-quarter earnings of $832 million, or 38 cents a share, on revenue of $5.6 billion, up 14 percent from a year ago. Non-GAAP earnings were 49 cents a share. Wall Street was expecting fourth-quarter non-GAAP earnings of 46 cents a share on revenue of $5.49 billion. As for the outlook, CFO David Goulden projected non-GAAP earnings of $1.70 a share on revenue of $22 billion. Wall Street was expecting $1.71 a share in earnings and $22 billion in sales. In a statement, CEO Joe Tucci touted the company’s ability to hit the key movements—cloud computing, virtualization, and big data—that are revamping enterprise IT. EMC’s RSA security business saw revenue growth of 16 percent in the fourth quarter. EMC’s VNX unified storage family had 2,000 new customers. 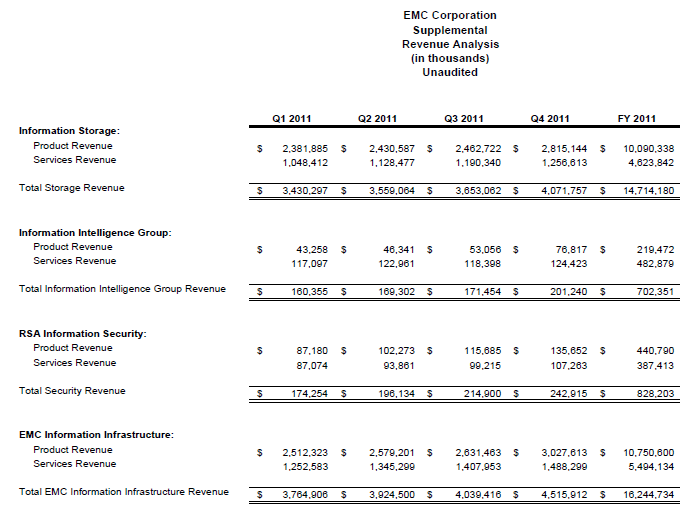 This story was originally posted at ZDNet's Between the Lines under the headline "EMC: Strong Q4, 2012 outlook on track."